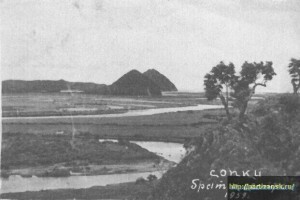 Two hills which look like pyramids are located in the valley near the river Partizanskay. The pyramids are named Sestra (Sister) and Brat (Brother). Brat use to be the same height as Sestra, the height of Sestra is 319 meters, they have 3 sides just like the sides of a Egyptian pyramid. These pyramids are located at mouth of Partizanka’s river. It’s very interesting and beautiful place!